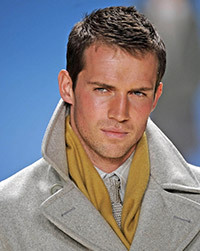 Andrew Cooper was born in England, United Kingdom on February 24, 1981, is an British male model and actor. Cooper was discovered at age of 16, by model scout from modeling agency Models 1. He is married to Jane Cooper, they have two children. DSECTION, i-D Magazine, GQ China, GQ Style Russia, L'Officiel Hommes Thailand Cover, Details. Hogan, Dunhill, Salvatore Ferragamo, Lancel, Banana Republic, Diet Coke, Gieves & Hawkes, Bally, Ermenegildo Zegna, Nautica, Esprit, Louis Vuitton, Gap, Nivea, Polo Ralph Lauren, Bamford, Bottega Veneta, Hugo Boss, Marks & Spencer. Represented by agencies New York IMG and London, Paris New Madison, Elite Milan, Barcelona View Management. I started by chance and was never really focused on it as a career I was just interested in making some easy money and meeting girls when I was 16 and didn't really know much about the fashion business. Being objectified by women is a pretty good feeling if you ask me, and I felt like a rock star. I love animals and have 2 American bulldogs and 3 cats. Also I am big into boxing/thai boxing which I have been doing since I was 12. My favourite summer juice is watermelon, lime and ginger. Its also a brilliant cocktail mixer – I like to use whatever is seasonal. I think male models, or at least the guys I have known, usually fall into the business for who they are so they are in the shape they need to be. It’s important to be professional and that will be the difference between someone having a good career or a short one.